Milton Williams has been saving lives and feeding firefighters for three decades. The recent national attention is just the cilantro on top. Milton Williams, a 6-foot-4 former UT Arlington football player and current father of four, didn’t set out to be a firefighter. As a student at James Madison High School, he was more interested in architecture. But after he dropped out of college, Williams says his brother, who was working for the city of Dallas at the time, told him he should apply. One of his first mentors was an older driving engineer, who was also the station’s full-time cook. He was always the first one in and the last one to leave. “When you’re the cook in the fire station, you’re probably one of the most respected people around,” Williams says. He decided to follow in the cook’s footsteps. It wasn’t hard for him to do. He had spent his childhood in the kitchen with his mother and his grandmother, asking questions while waiting to lick the cake beaters. 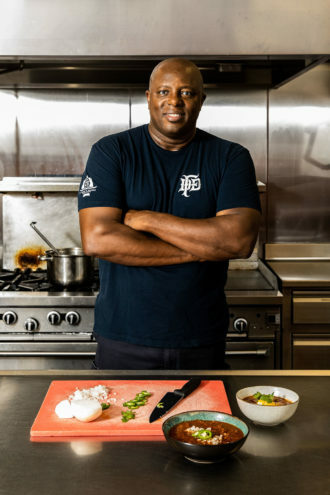 In the firehouse, he started with standards, grilling steaks and frying chicken, before deciding to try his hand at Texas chili. The first attempt was an unmitigated disaster, dubbed “tasty ketchup” by the crew before being tossed in the trash. “I was pretty embarrassed about that,” Williams says. “As a matter of fact, I called my mom and asked her, ‘Hey, what do you put in your chili?’ ” The answer—Wick Fowler’s chili kit in a box—wasn’t helpful. The breakthrough came during a trip to Albuquerque 20 years ago, when Williams discovered smoked chipotle peppers. Then this past August, Hormel Foods named his chili one of the five best firehouse recipes in the country. Sharon Baroncelli, the director of development for the National Fallen Firefighters Foundation, told Hormel about Williams and encouraged him to submit his recipe to the contest. Williams had worked with Baroncelli on Carry the Load events, as a member of the board of directors for the Krodle Memorial Foundation. The local foundation is named for Lt. Todd Krodle, who came to Williams’ station as a rookie and later became his lieutenant. Near Dallas National Golf Club, on the edge of Grand Prairie, Fire Station 50 is only 5 years old. The modern structure, designed by Perkins+Will, has a patio with a charcoal grill, a professional-grade kitchen, and a separate refrigerator and pantry for each of the three shifts. Despite the amenities, it took Williams some getting used to when it opened. It was hard for him to leave his old station, where he had memorialized two of his close friends who had been lost in the line of duty. He made sure to bring at least one tradition with him to the new firehouse. Williams’ chili is named for the Memphis Cyclones, his Panhandle high school’s mascot. 1 teaspoon salt and cook until done. Drain excess oil, then transfer mixture to a large stockpot. Turn heat to medium low and add all of the chili powders, spices, black pepper, and 2 tablespoons salt. Cook until well incorporated. Add tomato sauce, diced tomatoes, and beer. Cook uncovered on low heat for about 2 hours. Use tomato paste to thicken chili if needed. Garnish with avocado, cilantro, sour cream, jalapeño, and cheese.